Four hundred years ago a pair of brave, but no doubt anxious, French Jesuit missionaries landed at Port Royal in Acadia on the shores of the Bay of Fundy. In 1611 the small fort was a gateway to the vast, unexplored territory called New France. Over the decades that followed, the Jesuits moved steadily inland and, while fulfilling their mission as evangelists, they also became explorers, cartographers, educators, chroniclers and pastors. More so than any other religious order, the Jesuits not only witnessed the birth of Canada, they shaped significant parts of its history. To commemorate the 400th anniversary of their arrival to the “New World” and to celebrate their many spiritual and temporal contributions to Canada, The Catholic Register has published this 36-page homage to the Jesuit priests and brothers whose courage brought them to our shores in 1611 and whose faith and commitment to service has entwined them in the fabric of Canadian life to this day. We originally envisioned this tribute as a 12-page section. But it tripled in size over the summer due to an outpouring of support from the many organizations on these pages that wanted to extend their own congratulations in an advertisement. As a result, when the special section is combined with our weekly 20-page paper, the 56-page Catholic Register you are holding is probably the largest we’ve ever published. The story of the Jesuit martyrs is an important part of the Canadian education curriculum. 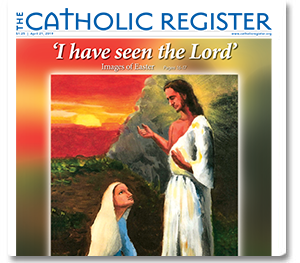 Therefore, in addition to being delivered to subscriber homes, an additional 14,000 copies of the Jesuit section have been printed for distribution to more than 1,000 Catholic elementary and high schools in Ontario at the expense of The Register. This 400-year milestone is worthy of celebration. We hope you enjoy it. The Catholic Register is proud to honour the 400th anniversary of the Jesuits arrival in Canada with this 18 part special feature. You can view the articles in the embedded reader below as they were printed in the newspaper . Click the "Expand" button in the centre of the player to go full-screen for the best reader experience. You can then zoom in on specific pages with the magnifying glass button or by using the scroll wheel on your mouse. Click to the side to navigate through the pages and press the ESC key on your keyboard to exit. 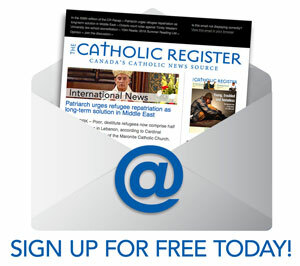 You can also enjoy the articles on catholicregister.org. Just use the 18 links below the reader to browse through the stories. I met Jesuit Father Bill Maurice on the roof of the mission house on the Fort William Reserve, on the edge of Thunder Bay, Ont. He was repairing an outdoor loudspeaker which he had mounted to broadcast prayers and other vital messages to the surrounding households. It was early spring with the wind whipping off Lake Superior and I had been wondering why an 82-year-old man was scrambling about on the roof with a pair of pliers and a screwdriver. Once he had persuaded me up to the roof and started handing me tools I was not so much mystified as aghast. As he handed me tools, he was talking. Maurice had opinions about theology, liturgy, politics, the weather, hockey and everything else but I wasn’t catching much of it while I hung on to the TV antenna. I eventually learned Maurice wasn’t just a colourful, crazy character. He was a Jesuit, one of more than 2,000 Jesuits who have been entwined in Canada’s history since 1611. Just as students in Jesuit schools inscribe the top of their exam papers with AMDG, the old priest had carved Ad Maiorem Dei Gloriam (“to the greater glory of God”) into his soul and into every day of the 92 years he lived. The journey from theological debate at the University of Paris to a Huron village on the shores of Georgian Bay in the 17th century was long — physically and psychologically. St. Jean de Brebeuf’s “Instructions for the Fathers of our Society Who Shall Be Sent to the Hurons” hints at the cultural chasm Jesuits were prepared to cross. You must have a sincere affection for the Huron — looking upon them as ransomed by the blood of the Son of God, and as our brethren with whom we are to pass the rest of our lives. To conciliate the Huron, you must be careful never to make them wait for you in embarking. Tuck up your gowns so that they will not get wet and so that you will not carry either water or sand into the canoe. Be careful not to annoy anyone in the canoe with your hat; it would be better to take your night cap. You must provide yourself with a tinder box or with a burning mirror, or with both, to furnish them fire in the daytime to light their pipes, and in the evening when they have to encamp; these little services win their hearts. You should try to eat their sagamite or salmagundi in the way they prepare it, although it may be dirty, half-cooked and very tasteless. As to the other numerous things which may be unpleasant, they must be endured for the love of God, without saying anything or appearing to notice them. It is well at first to take everything they offer, although you may not be able to eat it at all; for, when one becomes somewhat accustomed to it, there is not too much. You must try to be, and to appear, always cheerful. You must so conduct yourself as not to be at all troublesome to even one of these Hurons. Do not undertake anything unless you desire to continue it; for example, do not begin to paddle unless you are inclined to continue paddling. Finally, understand that the Huron will retain the same opinion of you in their country that they will have formed on the way; and one who has passed for an irritable and troublesome person will have considerable difficulty afterwards in removing this opinion. When Frs. Pierre Biard and Ennemond Massé arrived in Canada in 1611 their religious order was a relative infant. In 1611, the Jesuits had only been in existence 71 years, compared to the Benedictines who were more than 1,000 years old, or the Dominicans and Franciscans who were each about 400 years old. But the Jesuits wasted no time in taking the Gospel to the frontiers. Just one year after the Society of Jesus was formally approved by Pope Paul III in 1540, St. Francis Xavier left for the far east. And by the time the Jesuits came to Canada, they had already established missions in the far east, Africa and Latin America. St. Francis Xavier’s incredible success in India and Indonesia, heroic efforts in Japan and doomed attempt to reach China — all in the space of eight years — established a Jesuit pattern of absolute commitment to spreading the Gospel. Ignatian spirituality, the foundation of the largest religious order of men in the world, had humble and unusual beginnings: three lay students sharing a dorm room at the University of Paris. But these were no ordinary students. The first was Ignatius of Loyola, a converted soldier who had encountered God in a vision, and the other two were as deeply rooted in their faith as he. In that dorm room, Loyola led Francis Xavier and Peter Faber through the Spiritual Exercises, a 30-day prayer pattern he had developed. That same pattern is still used today, and is at the core of the Society of Jesus. Some years ago, at a graduation ceremony at Gonzaga High School in St. John’s, Nfld., Fr. Len Altilia was struck by the opening line of a student’s valedictorian address. “This school has been our home where we have felt at peace, respected and cared for,” said the student. Altilia recalls the moment with pride. “I thought to myself, ‘Wow! we’ve succeeded,’ ” he said. Altilia was not just pleased by the success of another class of graduates, but by the student’s recognition that his education was about more than academics. It was also about respect and caring, and about developing concern for the well being of others. Those have been guiding principles of Jesuit education for 500 years. 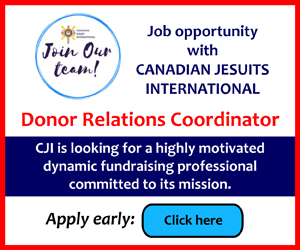 Education has always been a focal point of Jesuit ministry in Canada. In the 16th century, Jesuit founder St. Ignatius Loyola advocated development of the whole person — the mind, body and soul — through an education that nurtured healthy physical habits and a loving relationship with Jesus. His approach might be summarized as: academics, exercise, culture and prayer. French Jesuits schooled in the Loyolan tradition brought those values to Canada in the 17th century and on that foundation they built Canada’s first schools. Three hundred years later, Altilia was acknowledging that those founding principles remain intact. He is just one of many Jesuits who have dedicated their lives to teaching. After Gonzaga, he taught for 25 years in Catholic schools in Toronto (Brebeuf College high school) and Montreal (Loyola High School). Wherever he went, he noted the Jesuit emphasis on educating the whole person and developing students who expressed concern for the well-being of others. In the formation of young people, Altilia said Jesuits strive to make students realize “they will have a responsibility and ability to make the world a more humane and caring and compassionate place by the application of their skills.” That message was delivered to him in the 1970s in a talk given by then-Jesuit Superior General Fr. Pedro Arrupe. Arrupe said the test is not in the number of professionals turned out, but how well graduating students infuse their lives with Gospel values that promote faith and justice. The history of Jesuit education in Canada began in 1635 with the opening in Quebec City of the Collège-des-Jesuites. It was founded by St. Antoine Daniel, who was martyred 13 years later. The school would last until the British conquest of 1759 and evolve into Laval University, North America’s oldest university. Its first famous alumnus was explorer Louis Joliet who, with Jesuit Father Jacques Marquette, was the first non-native person to reach the Mississippi River. The Collège-des-Jesuites served as a model for at least 14 other educational institutions across Canada. Montreal’s Collège Ste-Marie, opened in 1848, spawned three other schools, Loyola (1896), St. Ignace (1927) and Jean-de-Brébeuf (1928). Those were followed by English colleges and high schools opened in Sudbury, Edmonton, Regina, Kingston, Winnipeg, Halifax, St. John’s and Toronto. The operation of many of those schools has since been passed to lay administrators, but the Jesuits remain involved in seven schools: Loyola High School and Jean-de-Brébeuf College high school in Montreal; Regis College at the University of Toronto; St. Paul’s High School in Winnipeg; Campion College at the University of Regina; St. Bonaventure’s College in St. John’s; and Mother Teresa Middle School that opened this month in Regina. Another aspect of the Jesuits’ involvement in education is research. At the University of British Columbia’s St. Mark’s College, Fr. John McCarthy lectures in ecological theology. He is also the college chaplain. During the summer, McCarthy conducts research on lichen biodiversity for the Newfoundland and Labrador Department of Environment and Conservation. In Toronto, Fr. Rob Allore is a research scientist at Mt. Sinai Hospital’s Samuel Lunenfeld Research Institute specializing in genetics and the development of the nervous system. He also teaches in the human biology department of the University of Toronto. “As a teaching order, Jesuits have long held up the development of our mental faculties as a path to God and a means to a better understanding of ourselves and our neighbour,” Allore said. The Jesuit education philosophy that combines academics, faith and social justice remains evident throughout Jesuit schools. For example, at St. Bonaventure’s College, an independent Catholic high school in St. John’s, Nfld., for students from kindergarten to Grade 12, that holistic education approach is evident in regular student involvement in inner-city charitable initiatives. “What we try to bring across is to train young people to be young men and women for others, so when they graduate they are excellent in academics and care for other people,” said Fr. Winston Rye, the school’s first principal. A pillar of Jesuit ministry is a commitment to education. Since the 1635 founding of the Collège-des-Jésuites in Quebec City, Jesuit colleges and high schools have graduated thousands of students, including dozens of people who rose to prominence across all sectors of Canadian society. Here is a sampling of Canadian-born, Jesuit-trained laymen. o Pierre Elliott Trudeau, Prime Minister of Canada, 1968-1979; 1980-1984.
o Robert Bourassa, Premier of Quebec, 1970-1976; 1985-1994.
o Georges P. Vanier, Governor General of Canada, 1959-1967.
o Don Ferguson and Roger Abbott, stars of radio and TV program Royal Canadian Air Farce, 1973-2010.
o Jim Flaherty, Minister of Finance, 2006 to present. o Sam Roberts, Juno award-winning rock musician. o Mike Murphy, former NHL player and coach of the Toronto Maple Leafs. o Joseph Boyden, Giller Award winning author of Through Black Spruce and Three Day Road. o Kevin Sullivan, film director of Anne of Green Gables and Road to Avonlea. o Terence Leon, president of Leon Company furniture stores. o Angus Reid, founder of polling company Angus Reid Group (now Ipsos-Reid). o Gary Doer, Premier of Manitoba, 1999-2009, and currently Canada’s ambassador to the United States. o John Ferguson, Jr., general manager of the Toronto Maple Leafs, 2003-2008. From the 1611 arrival of the first Jesuit missionaries on Canadian soil to well after Confederation, Canada’s Jesuit priests and brothers engaged in ministry across Quebec, Ontario and into the West. 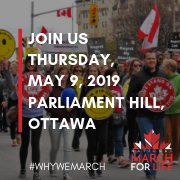 But for most of the last century, they’ve also looked beyond Canadian borders and taken the Gospel message of faith, peace and justice to marginalized people in distant lands. Almost 500 years ago, Jesuit founder St. Ignatius Loyola urged St. Francis Xavier to “Go forth and set the world on fire with the love of God,” as St. Francis departed to spread the Gospel in India and Japan. That same message carried the first French missionaries to Canada and today it inspires Canadian Jesuits around the world as they live out the order’s unwavering commitment to social justice through international development. 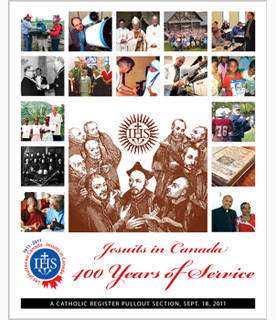 Today Canadian Jesuits can be found in Asia, Africa, the Caribbean and Europe. 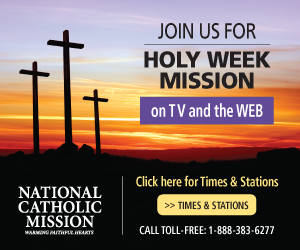 They are engaged in missionary work overseen by the Bureau des Missions in Montreal and Canadian Jesuits International in Toronto. The two offices co-ordinate significant international undertakings in the areas of education, pastoral care, social services, community development, agriculture, peace-building and social justice. The term social justice may seem inseparable today from images of building schools in Africa, defending the rights of the oppressed and lobbying in the corridors of power. The image it likely doesn’t provoke is that of Luigi Taparelli D’Azeglio, the 19th-century Jesuit who coined it. Social justice, widely used to describe the promotion of human rights and dignity of every person, was introduced in 1840, but only recently has it taken such a large role in both the secular and religious world. Even the Jesuits, its architects, have only developed a modern understanding of social justice in the last quarter century. In Jamaica they called Fr. Martin Royackers a “roots man.” Around the world, Jesuits and their friends call him a martyr. He was the first English Canadian Jesuit to be killed on the job. Royackers was born and died in farming communities. Born Nov. 14, 1959 near Strathroy, Ont., he was killed outside St. Theresa’s parish church in Annotto Bay, Jamaica, June 20, 2001. Fr. Prosper Bernard, Fr. Alphonse Dubé and Fr. Armand Lalonde were three of more than 100 Quebec Jesuits who became missionaries in China between 1918 and 1954. They are also three of more than 300 Jesuits worldwide martyred in the 20th century. The involvement of Quebec Jesuits in China started with an invitation from France’s Jesuits. A few helping hands were sent from Quebec to Shanghai. But their numbers quickly grew as Quebeckers embraced the mission to China. Jesuit missionaries were supported by Quebeckers through the Holy Childhood Association and parish-based missionary weeks. “There was incredible international awareness (in Quebec),” said Jesuit historian Fr. John Meehan of Campion College in Regina.